Nineveh Plain Protection Units (NPU) and the Restore Nineveh Now Initiative Joint Statement on the Involvement of Mr. Matthew VanDyke with the NPU. The Nineveh Plain Protection Units (NPU) and the Restore Nineveh Now, a global Initiative of the American Mesopotamian Organization issue a joint statement on Mr. Matthew VanDyke's involvement with the NPU. The NPU have asked Mr. VanDyke to refrain from using any image, title or reference to the NPU in any capacity, commercial or otherwise. The rank and leadership of the Nineveh Plain Protection Units (NPU) wishes to clarify that Mr. VanDyke and his company Sons of Liberty International (SOLI) are no longer being employed in any capacity by the NPU and have not been since February 19, 2015. The NPU have asked Mr. VanDyke to refrain from using any image, title or reference to the Nineveh Plain Protection Units (NPU) in any capacity, commercial or otherwise. 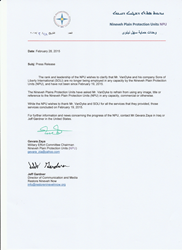 While the NPU wishes to thank Mr, VanDyke and SOLI for all the services that they provided, those services concluded on February 19, 2015. For further information and news concerning the progress of the NPU, contact Mr. Gevara Zaya in Iraq or Jeff Gardner in the United States.